← The Future of IT Jobs and IT Careers: Where will you fit in? In following up on Dave Wells’ article titled The Evolution (and Opportunity) of Technology Careers, I’d like to take a different look into the challenges of trying to understand why some people are happy and successful in a technology career, while others just continue to struggle. See Dave’s article at The Evolution and Opportunity of Technology Careers. The concept of program, project, and operations as a significant technology career influence is one that I’ve worked with for years and over that time it has inspired quite a bit of discussion. While Dave’s ideas about information, data, and systems are interesting, I think that they need to be slightly adjusted from a career perspective. Instead of information, data, and systems let’s look at information, data, and technology. Today’s reality is that information and technology are diverging. So what makes sense from a career perspective is data, information, and technology roles. In my IT career guidance role, I see a lot of potential value to use this view as a framework to build career roadmaps. Let’s look at the technology career roadmap for a persona that we’ll call Raoul. He started his career as a maintenance programmer, which clearly places him in the bottom right corner. Within a few years he moved from maintenance programming to software development, placing him at the intersection of project work and technology. His project work has sparked an interest in data and he now aspires to become a data architect at the intersection of data program work. 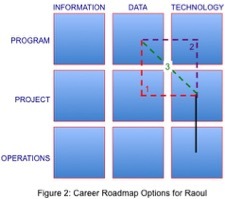 Raoul’s career roadmap options are illustrated in Figure 2. Raoul has a number of options to consider. 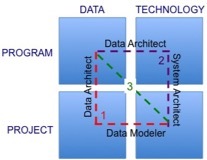 He could stay at the project level and move horizontally into data as a data modeler (that’s path 1 in red) then move from data modeler to data architect. He could stay in the technology space moving from project to program level by becoming a systems architect followed by a shift to data architect (that’s path 2 in purple). He could move diagonally from technology/project to data/program, but that’s a pretty aggressive move and likely more difficult to achieve. The edge-to-edge moves illustrated by paths 1 and 2 tend to be easier because the gaps between tiles are not as great as when attempting a corner-to-corner move such as illustrated by path 3. So which path makes best sense for Raoul? 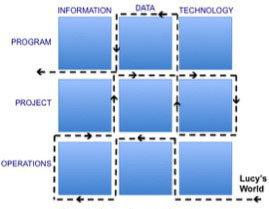 Following path 1, he gets advantage from his project achievements and relationships and begins to develop data experience. Following path 2 he gets advantage from his technology and programming achievements and relationships and shifts from developer to architect. Each works as a step along the path to his ultimate goal of becoming a data architect. The best path depends on a combination of his interests and the job opportunities that are available to him. Now let’s look at Lucy, another persona. At various times throughout her career, Lucy has worked as a business data analyst (project/information), a DBA (operations/data), and a data architect. Lucy’s data architect role was especially interesting because some of the most important work that she performed was as a liaison between the architecture group and project team. She was working not in a single tile but in two adjacent tiles – program/data and project/data. Lucy’s career roadmap is illustrated in figure 4. 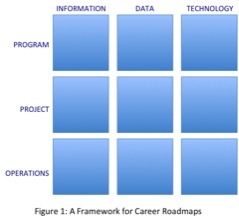 I’m in absolute agreement with Dave Wells in that the use of roadmaps in technology career planning will continue to grow as the field expands to include big data, analytics, and other advances. There will be many interesting times ahead of us as technology demands increase and the IT field diversifies with business units assuming many roles that have traditionally existed in IT departments. Rapid evolution of both technology and skills will continue to be the norm as abundant opportunities emerge for every data, information, and systems professional. This entry was posted in Building Your IT Career, Uncategorized and tagged Data Analytics, IT careers, IT Job Search Search, Technical Careers, Technical Job, technology resumes. Bookmark the permalink.